The European All-Terrain Vehicle Safety Institute (EASI®) is a 'not for profit' organisation tasked to deliver a programme of safety education, training and awareness for ATV riders (sit astride) and SbS (side by side sit in seat configuration) Operators in the UK. EASI's primary goal is to promote the safe and responsible use of ATVs & SbS's thereby reducing the number of accidents and injuries that may result from improper operation. EASI Rider is an introductory safety training course which takes four and a half hours, is available for ATV riders aged 6 and above and normally costs £180.00 + VAT per person. For more information about course content go to Rider Training. Anyone buying a new or used ATV from the leading SIX manufacturers (Honda, Kawasaki, Polaris, Suzuki, BRP and Yamaha) via one of their authorised UK dealers is eligible for FREE or highly subsidised EASI Rider training, subject to qualifying terms, conditions and availability. EASI SbS Driver course is an introductory safety training course which takes five hours, is available for SbS Operators aged 10 and above and normally costs £180.00 + VAT per person. Anyone buying a new or used SbS from the leading SIX manufacturers (Honda, Kawasaki, Polaris, Suzuki, BRP and Yamaha) via one of their authorised UK dealers is eligible for FREE or highly subsidised EASI Rider training, subject to qualifying terms, conditions and availability. Riders who need to know how to load, tow or reverse their ATV can add the three and a half hour QVC Generic Loading, Towing and Reversing (GLTR) module to the EASI Rider introductory safety course described above, subject to course availability. For more information about this module's content go to Rider Training. 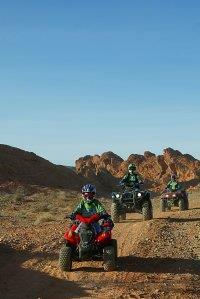 EASI works with a large and growing number of UK organisations to deliver ATV training courses to meet their needs. These include Police, Military and Coastguard organisations as well as public and private companies. EASI coaching and qualification schemes range from basic Supervisor Level Training to Advanced Instructor Qualifications applicable for Trekking and Outdoor and Activity Centres. Find out more about specialist ATV coaching courses and the most relevant qualifications to suit your professional needs. EASI acts as a Technical Expert for Hampshire LEA and provides expert witness consultancy and safety advice in legal cases concerning ATVs. EASI provides ATV Dealer Education programmes for the leading six manufacturers (Honda, Kawasaki, Polaris, Suzuki, BRP and Yamaha) and some 1000 individual dealerships across the UK. All EASI training programmes promote a responsible approach to environmental and countryside issues. Find out more about EASI's Environmental Code and how ATV riders can behave in a responsible and environmentally-friendly manner when out and about in the countryside and other rural environments.